through Wisconsin and Michigan during a weekend in February. February is short on days, but it can be long on adventure. Boy Scout Troop 33, chartered by the First Lutheran Church in DeKalb, experienced leap year through an incredible series of Scouting adventures. Imagine a month mixing rifles, cheerleaders, snowshoes, hymns, merit badges, an Eagle Scout, basketball, snowmobiles, a Catholic bishop, plus a 106th birthday party and more. The first weekend started with DeKalb County scouts gathered at the Klondike Derby, which included rifle shooting, orienteering, plus nine other events focused on testing scout skills. The following day, Scout Sunday, included simultaneous worships at both First Lutheran and St. Mary churches in DeKalb, followed by St. Peter’s Cathedral in Rockford where scouts Keegan Donnelly, Aidan Witthoff and Reilly Farrell received religious awards personally presented by Bishop David Malloy at a special Mass. On Feb. 8, the 106th birthday of Boy Scouts of America was celebrated with a Court of Honor highlighted by a presentation to Eagle Scout Cristian Rojo. The second weekend was a trip to the north woods for extreme adventure near Rice Lake, Wisconsin. Wind chill temperature plunged to -31 degrees. Scouts bundled up to snowshoe, cross country ski, build snow shelters, and enjoy winter fun. The third weekend included three events. A Friday event celebrated the Eagle Class of 2015 with a banquet and program attended by hundreds of people. On the following day more than 3,000 Scouts gathered in Elmhurst for Merit Badge University, a super day for earning merit badges. 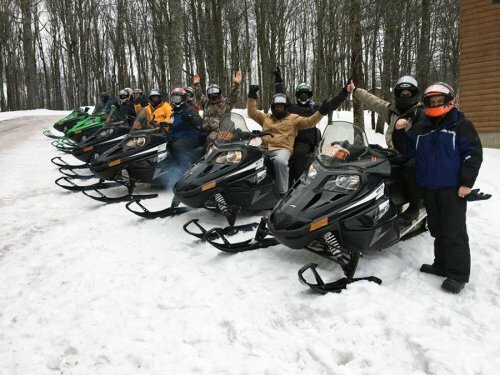 On that same weekend older Scouts snowmobiled a 110-mile adventure route across frozen lakes and snow-covered trails in Wisconsin and Michigan. They explored Nicolet National Forest and the Watersmeet Trail System with a highlight visit to Bond Falls. The fourth weekend took the scouts to the Northern Illinois Convocation Center where they watched the men’s basketball team defeat Western Michigan 76-67. A luxury suite was provided courtesy of KishHealth System. Also, the NIU Cheerleaders posed with them for a photo. Since 1925, Troop 33 has been serving boys in the DeKalb area with an exciting calendar of adventure-filled programs. Looking ahead to summer, Scouts will be paddling a 61-mile route across the Atchafalaya Swamp in Louisiana.